Every Hansgrohe Ecostat Select thermostatic mixer is just the way a thermostat should be. A Hansgrohe Ecostat Select thermostatic shower mixer as well as a Hansgrohe Ecostat Select thermostatic bath mixer reliably and exactly tempers water whenever you need it. Moreover the design of every Hansgrohe Ecostat thermostatic mixer will fulfill all your wishes. Do you prefer round shapes? - In this case we advise you to choose a Hansgrohe Ecostat thermostatic mixer or a Hansgrohe Ecostat thermostatic shower mixer with eco-friendly Eco Stop button. 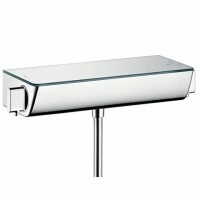 Or are you looking for an angular Hansgrohe Ecostat Select thermostatic bath mixer? – Of course you will easily find both in this category.